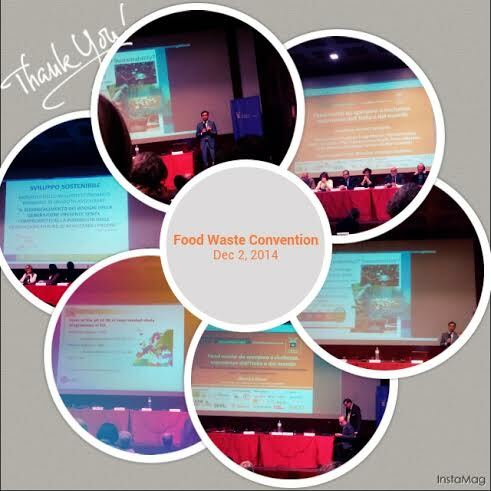 Exactly last month, on Dec 2, 2014, I attended a very interesting convention held in Milan about food organized by OTALL (Order of Food Technologists of Lombardy and Liguria Region). The convention was talking about the facts regarding food loss and food waste happening around the globe that are caused during the processes and also by the behaviour of food distributors / retailers or us as consumers. Having presented in the convention was also Mr. Fonseca from Food and Agriculture Organization (FAO – United Nations – UN). In the convention, it was explained better about the causes of food losses and food waste that have made tons of food unable to be delivered and consumed. The term food loss refers to the processes of food in the chains and distributors that fail and result on the decrease of the amount of food supply that can be delivered to retailers or consumers. On the other hand, the term food waste could refer more to the behaviours of retailers, restaurants and even us as consumers who throw the food away during the final stages, when the food is sold or consumed. According to FAO’s research, around twenty to fifty percent of food are lost and wasted yearly, which have varied from crops, cereals to fish and others. The cause of food loss during the production and processes could depend from one country to another based on its local situation. For example, in many developing countries, with the limit of technology and management ability, surely the possibility of food loss could be higher. When the food losses level are high, the risk for food insecurity becomes higher too, as well as the possibility of high food prices and food inavailability. However, with more collaboration and coordination, awareness, research and projects conducted, it’s hoped that we’d be able to reduce the level of food loss around the globe. When the food productions are improved in better ways, the questions later move on to the food waste by industries, restaurants and home-based costumers. The FAO has released global iniative for food waste and reduction in order to save more food and achieve zero hunger challenge in the future since it’s known that there are still more than 800 million of people starving and having no access to nutritious alimentation. The initiative to achieve the goal of reducing global hunger to zero seems like a great challenge with the current fact. However, with the right plans and application, it can be achieved together. In this matter, not only the United Nations, FAO and the WFP stand alone as there are also initiatives from Why Hunger together with Yoko Ono Lennon and then this year, there will be the global event of Expo 2015 in Milan regarding “Feeding the Planet, Energy for Life” for sustainable earth and alimentation.